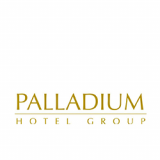 Palladium Hotel Group is a 50 years old Hotel group, with hotels all around America and Europe. Its online community is remarkable and with one of the highest engagement rate among its competitors. Due to an accurate social media strategy, PHG achieved the leadership of its industry. 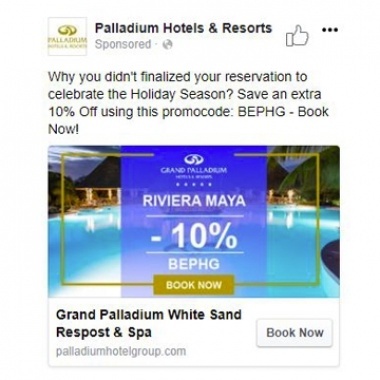 For this case, we focus on Black Friday & Cyber Monday campaign in America vs an ongoing campaign using the same ad format and objective: room booking through Facebook. How to stand out among all competitors? It's a great challenge for any brand to stand out among so many competitors and requires the most appropriate solutions to face up the situation. Adsmurai offers Dynamic Ads for Travel (DTA): an exclusive ad format for hotel booking segment + Feed Composer (created by Adsmurai): the new tool to attract users by personalizing and creating template layouts. DTA format aims to retarget those interested users individually and dynamically with its favorite rooms; far from DPA (only focus on product sells), DTA is focus on tourism business needs such as bookings & exclusive offers. When adding an extra tool such Feed Composer, to attract users through creative and personalized template layouts, makes results increase and get a cheaper price compared to standard dynamic ads. It is a pleasure to work with Adsmurai, they are professionals in the sector and they are always there when you need them. They listen, suggest and test continuously. You can always improve and that is the attitude that they work with. I would like to emphasize that, in addition to focusing on good results, customer service and attitude is impeccable.